Maybe you’ve heard of usage-based insurance, UBI for short, or maybe not. It’s an important topic that’s been gathering steam in the insurance space over the last decade. The concept is simple: drivers pay their insurance premiums based on how much they drive and the way they drive – thus, their insurance costs are based on how they actually use their vehicles. Drivers that travel an above-average number of miles or exhibit certain risky driving habits like speeding, hard braking, or driving late at night, end up paying more for their insurance than drivers who aren’t on the road as much and exhibit safer driving habits. It makes sense: if you drive part time, why should you pay insurance rates like a full-time driver? While the concept may sound relatively simple, the growth of UBI has been slow. Calculating insurance premiums from this type of data is complex, and the technology of accurately capturing and reporting all of this data has lagged a bit behind the concept. Additionally, some everyday, personal-use drivers have tended to stick with their traditional insurance plans rather than reveal their driving behavior data – perhaps not totally convinced they are as excellent a driver as they claim. But there is one UBI use case that is particularly compelling: the rideshare driver. If you’re a rideshare driver participating in the “gig economy,” you face different risks than others who use their cars to commute to and from work – you’re earning income specifically from the use of your personal vehicle. This means that unless you've purchased special coverage, your personal insurance policy almost certainly doesn’t cover you when you’re out driving for Uber, Lyft, or other gig economy platforms. That fact in and of itself should be a red flag for you and other rideshare drivers. You’re working to earn extra money or supplement your income and those dollars could be at risk if you’re driving around without proper coverage. 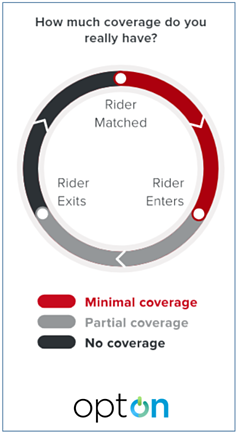 There also might be gaps in the insurance coverage your rideshare platform is providing, such as when you’re in Period 1 waiting to match with your next passenger. This presents a protection problem and optOn presents a solution. OptOn is UBI for rideshare drivers – on-demand insurance that can be turned on and off at the tap of a button. OptOn provides coverage for the entirety of the rideshare driver’s journey, for only cents per mile. Right now, we’re gearing up for launch. Want to be the first to know when optOn is available? Just fill out the form on our home page and we’ll let you know when we launch in your state.